A tradition that is becoming more and more popular is giving a gift to your husband/wife before the ceremony on your wedding day. Although a gift is not necessary, it can feel nice to be able to gift your spouse something special on your big day. Here are some ideas for what to gift your husband on your wedding day! A new watch for him to wear on the wedding day. You can have the back of it engraved with a little message or a portion of your wedding vows. It’s an even bigger bonus if it is a watch that he can wear every day too! You can gift him new cufflinks to wear on your wedding day and other special occasions in the future. I have also seen many people have these engraved with dates or initials too! A gift that he can use on they honeymoon, like a nice pair of sunglasses if you are going to the beach or new ski gear if you are going to the mountains! Almost all men love a good wallet that will last them years. It would be even more special if it was a wallet that came from his wife on the best day of his life. Wallets are another gift that can be engraved. He will carry it around every day and always be thinking of you! To go along with the wallet you can write a little note and have a picture printed of the both of you for him to keep inside of it! Online photo books are so easy to make with sites like Shutterfly! You can create one with pictures from your entire relationship for him to read through and smile about. It might ease his nerves on the big day to see pictures of your smiling face over the past few years! Plus you can display it in your home after the wedding. 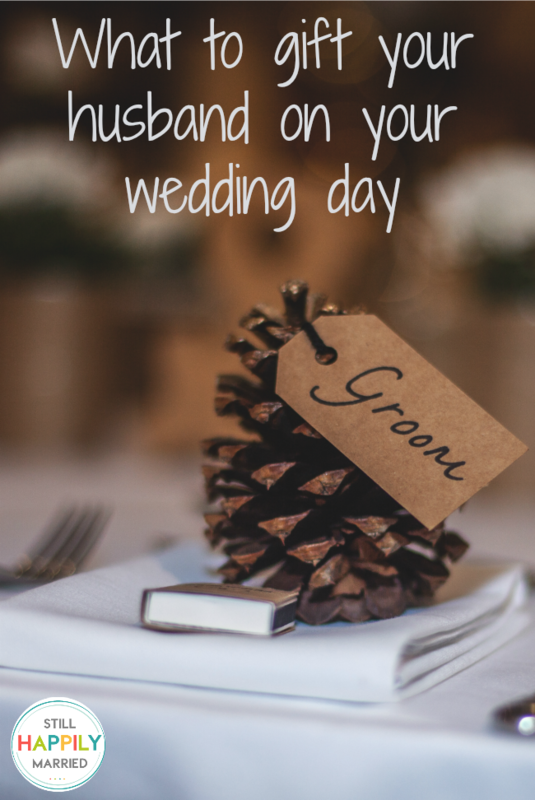 Gifts to your husband on your wedding day do not have to be monetary. Giving him something as simple as a handwritten letter can have more meaning than any gift you could have bought him at the store. Having something like this that he can read over and over again for the rest of his life can be so much more sentimental. Your wedding day is most certainly not about the physical gifts that you give one another, but merely an addition on top of an already perfect day. Simply saying your vows to one another and making that commitment is more of a gift than anything!